This post is finally out. After 12 months since i started this post and more than a year since the idea of this post was conceived, it’s finally out. I’m extremely sorry about the errors and having to repost but i cannot teach the wrong thing. 1. Awkward situations when you try to prove your physics teacher wrong but he ends up proving you wrong. 3. Writing the wrong answer in a test resulting in unsightly scores. This post is still pretty long but i hope you will enjoy it. Feel free to post in the comments any doubts you have and i will not hesitate to address them. This is the first part of another science concepts series. I will be introducing Special Relativity to you guys. This post is just to introduce you guys to the topic so don’t panic yet. Contrary to popular belief Special Relativity is actually very easy to learn. Yep that’s it! You can pick up the basics in a couple of minutes but i will going in some detail in this series. I picked up this knowledge from my physics teachers so before I even begin my post, i would like to thank Mr Damian Boh for his support in my pursuit for scientific knowledge and as a friend. I would also like to thank Mr Jeffrey Goh and Ms Sonia How for giving me the opportunity to pursue further knowledge in the field of science and for being very supportive throughout this journey. Okay so on to the the introduction. In a previous post, I explained a little on reference frames. If you haven’t read that post, go ahead and click the link to read it. Its pretty important in the understanding of this topic and i highly recommend that you read that post first (It takes only a couple of minutes). So how are reference frames important in this topic? As the name implies, Special Relativity relies on ‘Relativity’. An object’s relative velocity to another object. How does this all work? I shall explain the mechanics in a later post. As mentioned earlier, this post is just to give you a rough idea of how Special Relativity works. Special Relativity works on the idea that time and space are variables and they alter themselves to keep 1 thing constant. The first letter of my name: c. The speed of light (in a vacuum of course but to keep this post nice and short I’m omitting all the ‘in a vacuum’s so yes). It relies on the fact that the speed of light is a universal constant and is constant to any observer regardless of his/her/it/whatever ‘s velocity and whatnot. The idea can be represented by using a light-clock experiment but I’m going to use parabolic motion as an analogy first. When you throw a ball upwards in a van, the ball, to you, goes up and then down, just as it would while you were standing on solid ground. 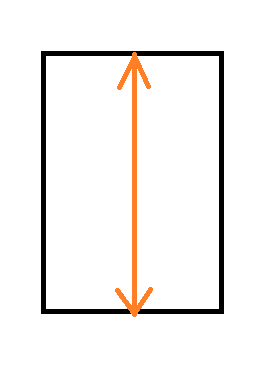 However, to some guy who just happened to see you throwing the ball, he would observe that the ball was travelling in a parabola, aka a curvy symmetric shape. 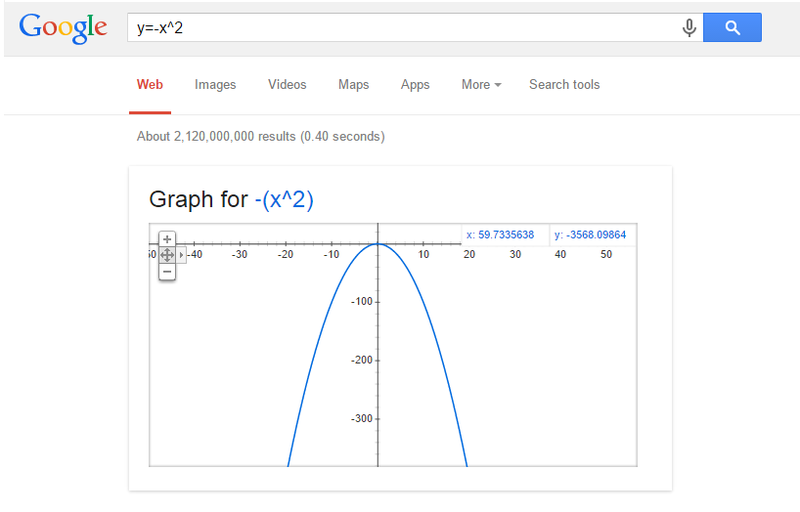 To picture this, you can type the function: y=-x^2 into your handy search engine, Google. The curve that results is a parabola. Now from this example you can thus see that the same event can be viewed in different ways. All you have to do is replace the ball with a photon (particle of light) and you will roughly get the idea of what happens. Well you’re right, it can’t so its time to end this post and forget about everything. Alright. So this “super-awesome-cool-type-thing-that-measures-accurate-time-and-is-generally-awesome-light-bouncing-time-changing-clock”, (We can shorten it to SACTTTMATAIGALBTCC but let’s just refer to it as a light clock for now) what does it do? Let me draw this awesome device. The way this light clock works is by bouncing a photon (our light particle) up and down the box. Every time the photon hits the ceiling of the box, the clock ticks once. Every time the photon hits the bottom of the box, the clock ticks against. This happens several million times in a second and by the frequency of ticks, we are able to determine the amount of time that has passed. However, the above is how the light clock looks like when it is stationary. When it moves, something crazy happens. The light now moves DIAGONALLY! And if you still haven’t realized, the light has to travel a longer distance due to it moving at an angle. Alright. Now take that in for a second. The interval between the ticks get longer. And now the clock is reading time wrongly. 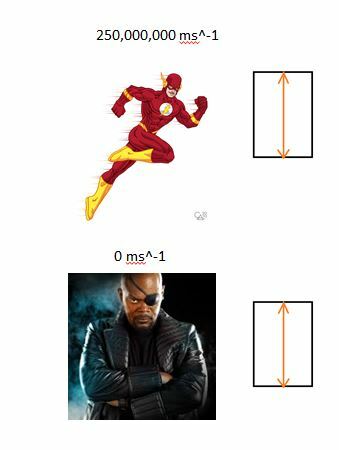 Remember the thing about the speed of light being constant? Regardless of what velocity the observer is travelling at? If you read my post, you would understand that the conflict between Galilean Relativity and Maxwell’s equations on electrodynamics has been resolved with Maxwell’s equations coming out ‘triumphant’ in some sense. So light does move at a constant velocity regardless of the velocity of the observer. 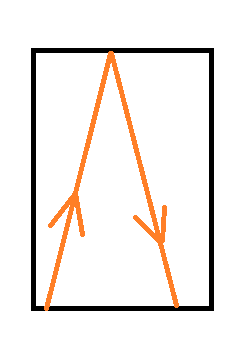 Meaning if I were travelling at the speed of light (which is impossible and I will explain why in a later post) light would still move at the same speed as it would to someone standing completely still. Perhaps I need to introduce some concrete numbers to make this clearer. 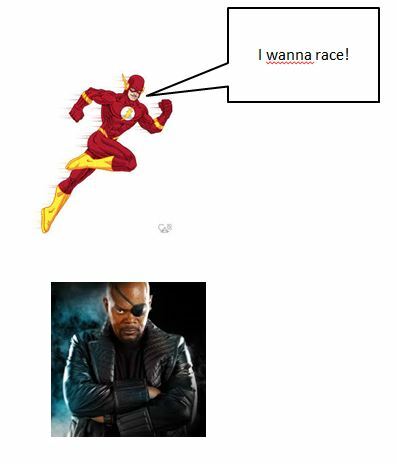 Say Flash (from DC) decided to challenge Nick Fury (from Marvel) to a race. 5 Seconds later, Superman (from DC) flies in and decides he’s had enough of this Flash guy. He stands beside Fury and starts firing his laser towards Flash. 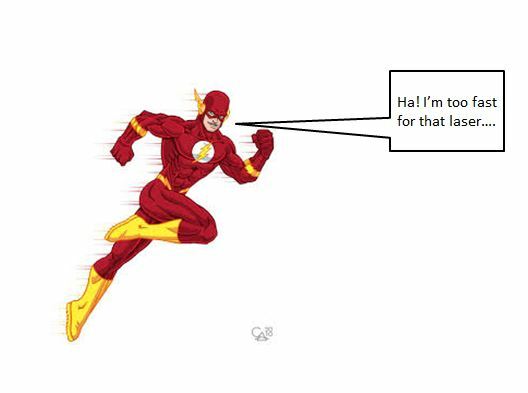 But Flash thinks that he won’t get killed because he’s running so flippin’ fast. But poor Flash didn’t read my blog. 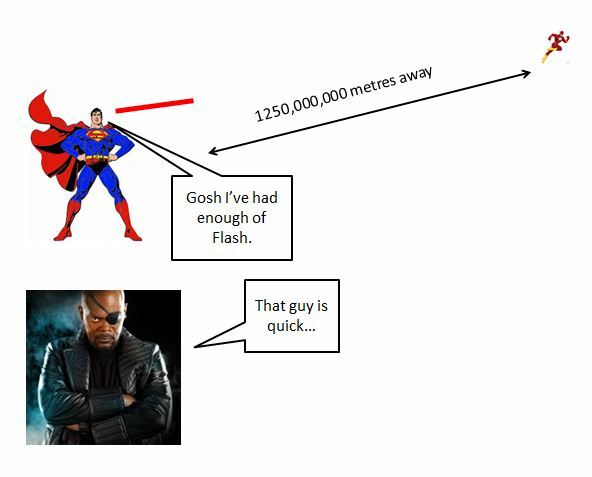 Flash thought that since he was travelling at 250,000,000 ms^-1m, the light would slowly approach him at 50,000,000 ms^-1. 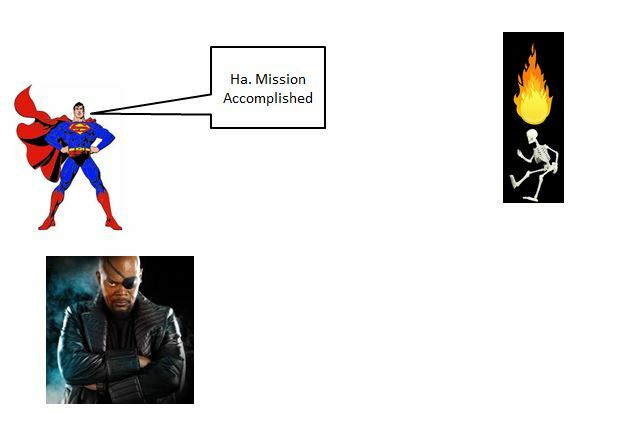 And with his 5 second headstart (which made him 1,250,000,000 m away from Nick Fury and Superman) the light would only reach him after 25 seconds, giving him some time to run away. 4.2 seconds later, Flash gets fried. Although he was travelling at 250,000,000 ms^-1, the light was travelling at 300,000,000 ms^-1 to him, clearing the 1250,000,000 m distance in that short span of 4.2 seconds. 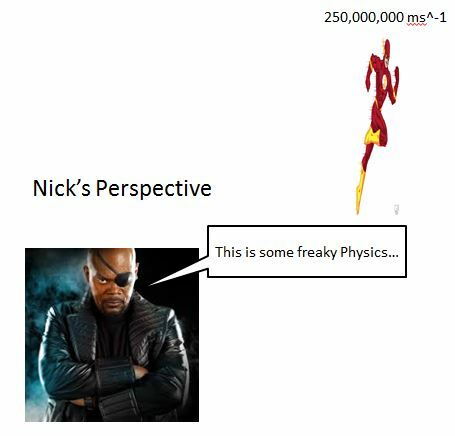 Though Nick Fury was sitting down, he watched the light travel towards Flash at 300,000,000 ms^-1. This is probably very puzzling to you. 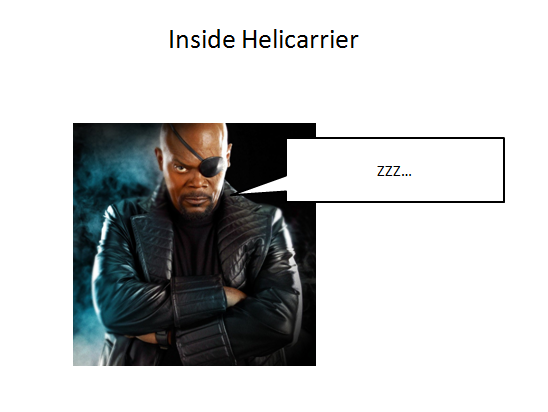 But Fury saw the light moving at 300,000,000 ms^-1. Let’s go back to that clock. 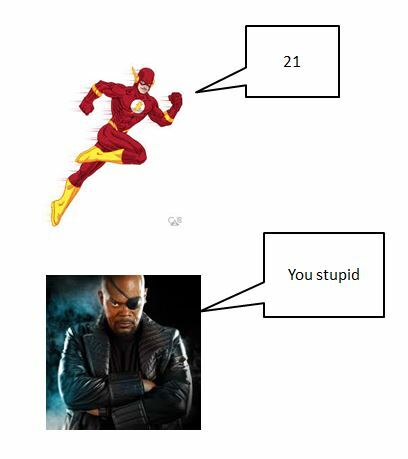 Let’s say Flash and Nick Fury were each carrying one of our light clocks. Since light travels at the same speed to Flash as to everyone else, his clock ticks along just fine. 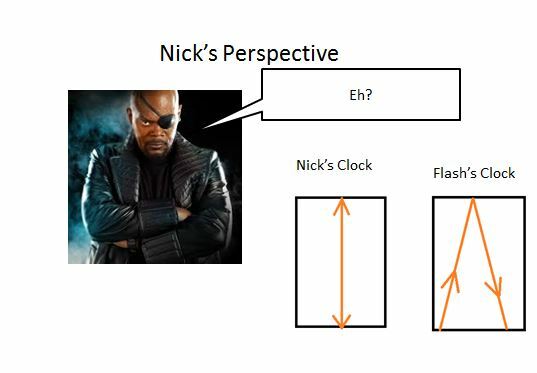 But if Nick Fury were to listen to Flash’s clock ticking and compare it to his own clock, since light travels at the same speed to Nick Fury as to Flash, Nick would hear Flash’s clock ticking much slower as compared to his own. Why? Because the light travels diagonally to Nick and travels a longer distance. Nick would see the light travel a much longer distance, thus making the clock tick slower, but to Flash the light still bounces up and down, ticking at the same rate as if it were stationary. Let’s take a step back from here. Let’s go back to reference frames. After all, relativity is all about reference frames. The above is only portrayed in Nick’s perspective. 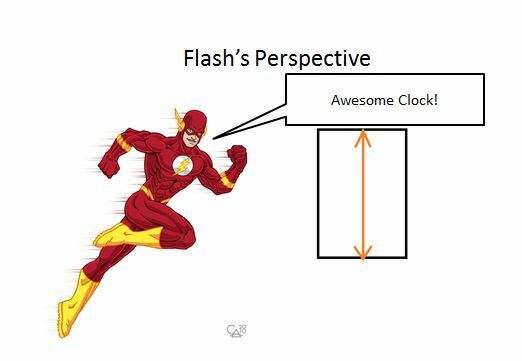 What about in Flash’s perspective? 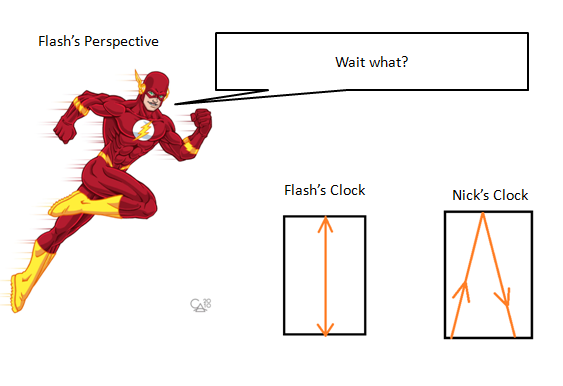 Flash would see Nick’s time slow down too. Why? This is due to the fact that there is no absolute reference frame. 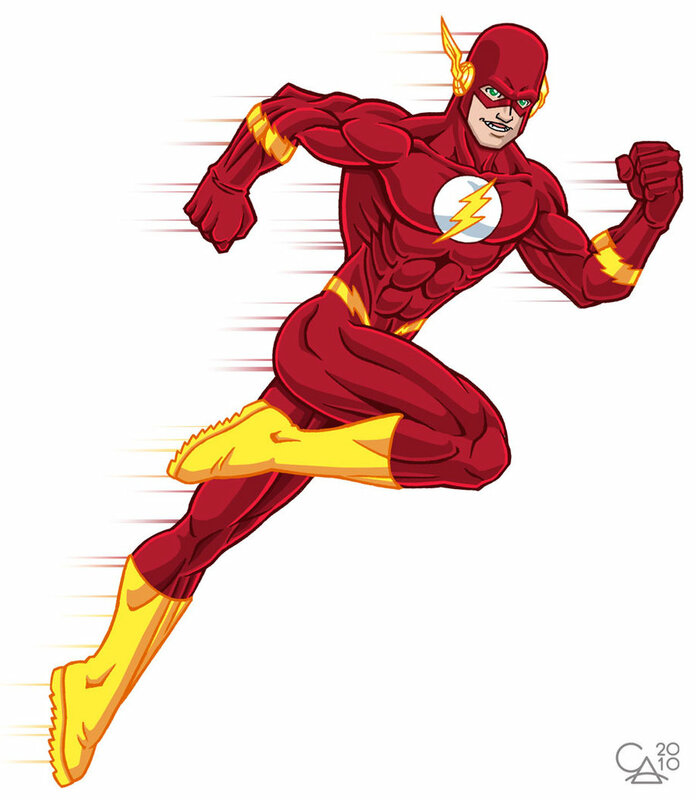 Be it Nick running or Flash running, there is no difference. 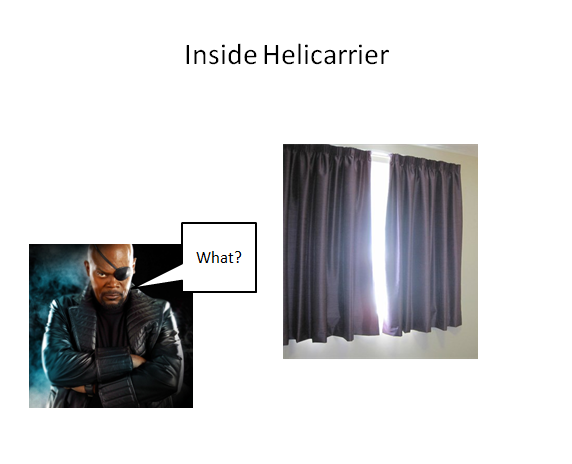 To explain this, let’s go back to Nick Fury. 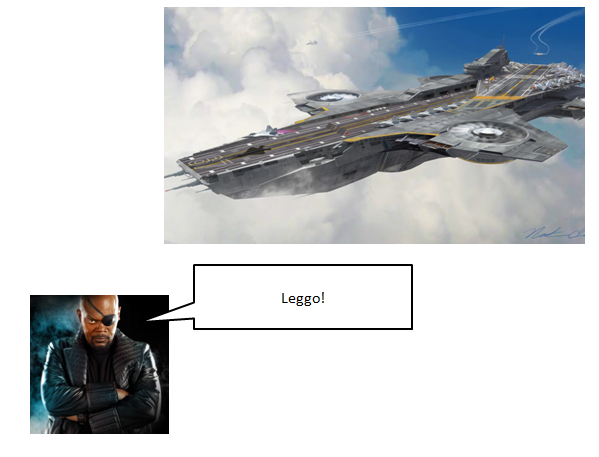 Now say Nick takes one of his S.H.E.I.L.D Helicarriers out for a spin. So while Nick is having fun flying his huge flying craft across the globe, he gets tired and takes a nap. Tony Stark decides to play a little joke on Nick by shutting all the windows. Perhaps he spent a little more time studying physics and knows how to confuse other people. Nick then wakes up, realising that he can’t see what’s happening outside. 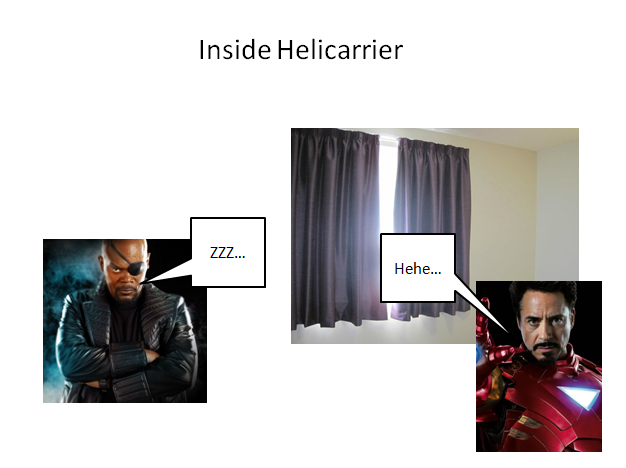 Now here’s the big question: Did the Helicarrier land or is it still in mid air? And here’s the big answer: You can’t know. The problem with this problem is that in Einstein’s theory of special relativity, it is impossible to tell if you are travelling at constant speed or if you are stationary for any experiment conducted in 2 different inertial reference frames will yield the same result. This means that every reference frame is equally valid and equally correct regardless of the observation it makes. So the question of who is right ultimately shouldn’t be a question, because both are equally right! Whose time slowed down? That ain’t even a proper question mate! Flash’s time is passing by slower than Nick’s. 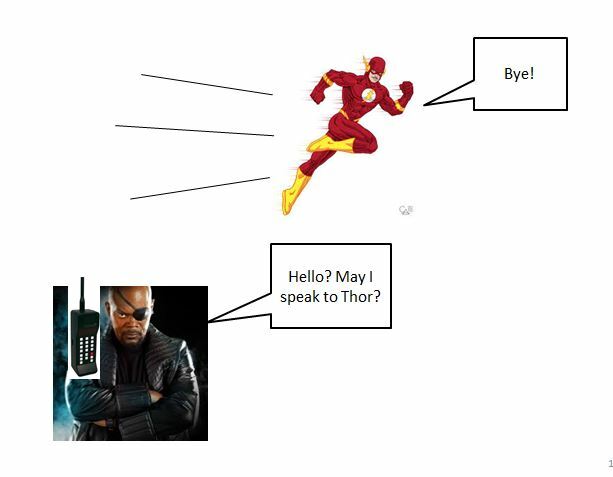 Say Flash ran next to Nick Fury. Nick would see an ultra thin Flash, almost like a Flash that had been squashed flat like a paper. Why? 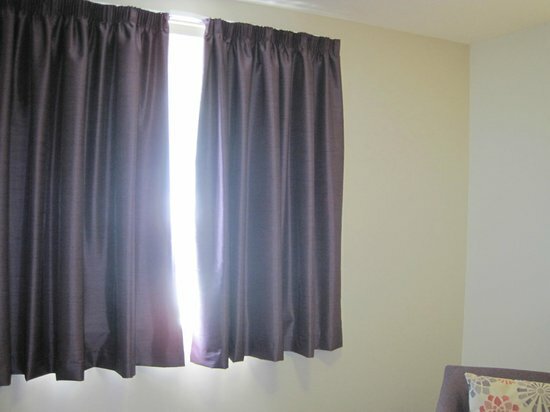 Because time slowing down isn’t good enough to account for light moving at the same speed. I can hear all of you going “Huh?” right now. Why does time slow down when you move faster? It changes to allow light to move at the same speed to you as to some other guy sitting on the ground. Let’s go back to the super heroes. Earlier we mentioned that Light should in fact have been moving at 550,000,000 ms^-1 when it in fact was only moving at 300,000,000 ms^-1. Now i shall tell you where all that extra speed went to. Since time slowed down, Light has more time to catch up to Flash. So actually light moves at the same speed but time slows down to accommodate for people who decide to move. But time slowing down isn’t enough. If you calculate the time change using the light clock experiment, it isn’t enough to account for the moving observer, so space also has to change, length has to shorten for light to move at the same speed. Essentially light is like a super unreasonable boss. You have to conform to him, even if it means that you have to bend and change. This is only half (actually 1/3) of the story. So far we have gone through Relativity of Space. There are two more parts of relativity which are sure to melt your mind (like it did to my mind when i tried to comprehend it). These are known as the Relativity of Time and the Relativity of Simulteinity. Look out for that in later posts. And that is Special Relativity, a story about an unreasonable and selfish boss changing the fabric of our universe to make him the fastest thing in the universe. I will be going through the calculations at a later date after i have completed the posts on the Relativity of Time and the Relativity of Simulteinity. In the meantime, if you have any other questions, go ahead and post them in the comments or send me a message via the contact page. If you find any part of this page to contain faulty logic/ wrong info, please post a comment or send me a message, you would be doing a service to everyone who reads this post after you. Thank you for reading this and have fun changing space and time! P.s: Tell me if you’d like to see more illustrations in the future.